Under the preservation program, developers get to build seven stories instead of six for preserving an old building facade in Pike/Pine. In the proposed HALA map, an up-zone in Pike/Pine would automatically allow for seven-story buildings. While preserving a facade would still get developers a one extra story, it seems unlikely they would take it. Building codes mandate that any building higher than seven stories must be entirely concrete or steel framed instead of wood, making an eight-story project vastly more expensive. However, a recent change in the building code set to take effect in January will allow for five stories of concrete or steel construction under three stories of wood. Officials from the Office of Planning and Community Development say that will help make the preservation program pencil out, although more tweaks could be needed. “As we refine this initial draft MHA proposal, we will ensure the Pike/Pine preservation incentive remains effective,” said OPCD spokesperson Jason Kelly. Now the only question is whether there are any character buildings left worthy of Pike/Pine-style preservation. Capitol Hill has plenty of M and M1 areas, but no M2s as it lacks any up-zones dramatic enough to trigger the highest level of affordability requirements (one M2 requirement, for example, will be placed in an area transitioning from a single family home zone to a neighborhood commercial zone). Those committed to allowing for the highest amount of density possible will likely lobby the city to include more dramatic up-zones in Capitol Hill’s densest areas. Business owners along Broadway (and all over Capitol Hill) have long been pining for more daytime office activity on Capitol Hill. HALA’s zoning maps could help make that happen. Both sides of Broadway between Howell and E Roy are slated for an up-zone that would allow for seven story buildings with commercial use throughout the entire building (currently, commercial uses are only allowed in the first four stories). That could bring a large office project or (another?) hotel to a part of Capitol Hill many say is in desperate need of daytime foot traffic. Chief among the HALA principles is that denser housing should be built around major transit centers. Several low-rise zoned blocks east of the Capitol Hill Station would go to mid-rise zones and be required to have a second-tier (M1) level of affordability. During last week’s Pike/Pine Urban Neighborhood Council, some members were disappointed to see that the Madison corridor was not slated for a similar up-zone given plans for a new Madison Bus Rapid Transit line. Currently, the low-rise zones just off Madison Ave are only slated for the standard HALA bump instead of an M1 level of affordability. PPUNC has been a leading proponent of the Lid I-5 campaign which envisions creating a lid over a section of the interstate to connect Capitol Hill and downtown with green space and possibly new development. While it’s unclear how exactly a new lid would be zoned or even who would be responsible for zoning it (that section of I-5 is managed by the state), members of PPUNC want to get out in front by rezoning the area to allow for the highest possible development. PPUNC is currently drafting a list of HALA rezone recommendations that will include larger up-zones to the areas directly under I-5. HALA represents a massive push to encourage the creation of thousands of new affordable apartments, but what happens when that new construction displaces existing “organic” affordable housing? The Central District and other neighborhoods were identified as areas at risk of such displacement in the Seattle 2035 report published in May. 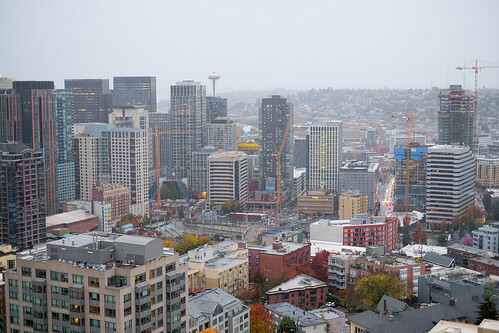 In response to these concerns, Mayor Murray recently announced that new developments in the Central District would be required to include an even higher level of affordable housing than initially announced. Under the update, the high-MHA geographic area has been expanded to include the Central Area and some areas of Capitol Hill. Developers of new projects in these areas would be required to make 7 to 11% of their units affordable to those at or below 60% AMI. “Requiring developers to build affordable housing or contribute to its construction helps us slow the rate of displacement caused by our city’s growth, making MHA a critical tool for ensuring our city remains affordable for everyone,” Murray said in a statement. City officials plan to hold five community meetings to gather public feedback on the maps. You can also take a closer look at the maps and submit feedback at hala.consider.it. This entry was posted in News, etc. and tagged affordability, city hall, development, hala by Bryan Cohen. Bookmark the permalink. Only a one-story zoning bump? Pssh. I have a hard time reading the map. Could someone please translate what this means for the neighborhoods off Union between 23rd and 19th? We’ll have more on that soon. Generally, the areas with hatching would receive a medium level up zone (single family to lowrise), the blocks with a single color would receive a more modest up zone (one extra story), and those just showing an aerial image (mostly single family zones) would see no changes. Wondering why that expansion, yet no LR1 at all to SE or SW of 23rd & Union? Not sure if this change will increase or decrease land values seeing as the increase comes and an expense of creating space that is less valuable as far as income goes. Yes, building a concrete and steel structure at only 8 floors is silly so this is mostly a ridiculous proposal as many won’t opt for it. On Capitol Hill, lets build 20-30 floor structures along arterials where the costs of development in concrete and steel are more viable when building at that scale. The Madison zoning is a problem. If the city is going to spend a boatload of money on a rapid ride investment, they are going to have to upzone Madison and environs. I wish the city would deal with it now rather than pretend it isn’t happening or (god forbid) reneg on adopted policy.